The CERTOMAT shakers are among the top selling laboratory shakers worldwide for cell culture, hybridization, staining and destaining gels, plasmid preps and combinatorial chemistry protocols. The universal benchtop orbital shaker CERTOMAT® S II with microprocessor control has a powerful, robust, triple bearing brushless drive. The units are quiet and vibration free even with heavy loads. Ideal for cultivating microorganisms and shaking separation funnels or other types of vessels. An LCD display shows shaking speed and time. Available with a choice of 25 or 50 mm orbit, it can be combined with a complete range of shaker accessories. To make it functional, every CERTOMAT shaker or incubation shaker requires a tray. 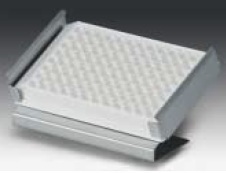 Available tray sizes are 420 × 420 mm (E/EU) and 800 × 420 mm (F/FU). Suitable trays, clamps and further accessories are listed with each instrument.